Although no trace of the Malaysia Airlines plane was found during the search in the southern Indian Ocean -- the most expensive ever of its kind -- large volumes of data showing a detailed picture of the sea floor had to be collected to guide the probe. 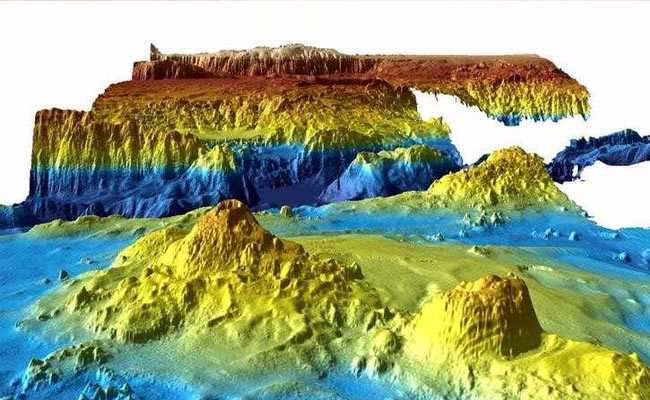 Sydney, Australia: The painstaking search for missing flight MH370 has uncovered a previously unknown undersea world of volcanoes, deep valleys and soaring ridges, according to detailed maps released by Australia. Scientists are hopeful the new maps will give their community greater insight into oceans. "It is estimated that only 10 to 15 percent of the world's oceans have been surveyed with the kind of technology used in the search for MH370," Geoscience Australia's environmental geoscience chief Stuart Minchin said late Wednesday. "(That makes) this remote part of the Indian Ocean among the most thoroughly mapped regions of the deep ocean on the planet. "So this data is unique both because of the remote location of the search area, and because of the sheer scale of the area surveyed." Minchin said the maps would also be useful for future scientific research, such as oceanographic and habitat modelling. Australia, Malaysia and China suspended the deep sea hunt in January, almost three years after the Boeing 777 disappeared with 239 people on board. The hunt -- based on satellite analysis of the jet's likely trajectory after it diverted from its flight path -- covered a 120,000 square-kilometre (46,000 square mile) designated zone, an area slightly smaller than England. Two shipwrecks were discovered during the search but no trace of the plane, deepening one the most enduring mysteries of the aviation age. However, the data revealed ridges six kilometres (3.73 miles) wide and 15 kilometres long that rise 1,500 metres above the sea floor, as well as fault valleys 1,200 metres deep and five kilometres wide. A second set of data will be released in mid-2018. While the search for the missing plane has been called off, Canberra has said it could be restarted if new evidence about the specific location of the aircraft emerges. "We remain hopeful that new information will come to light and that at some point in the future the aircraft will be located," Australia's Transport Minister Darren Chester said. Australia's national science body CSIRO released a report in April confirming that MH370 was "most likely" north of the former search zone. Three fragments from the plane have been recovered washed up on western Indian Ocean shores, including a two-metre wing part known as a flaperon found on La Reunion island. Speculation on the cause of the plane's disappearance has focused primarily on possible hijacking, rogue pilot action or mechanical failure, but nothing has yet been proved.